A still image from “Behind the Belt: A Look at China’s Cultural Influence in Kenya,” a film by Jidi Guo and Philip Man. Independent filmmakers Jidi Guo and Philip Man join Eric and Cobus to discuss their new documentary about how a new generation is responding to China’s growing influence in Kenya. This is the first documentary produced by the Shanghai-based pair, who took 10 days of vacation time from their day jobs to shoot the film in Nairobi. 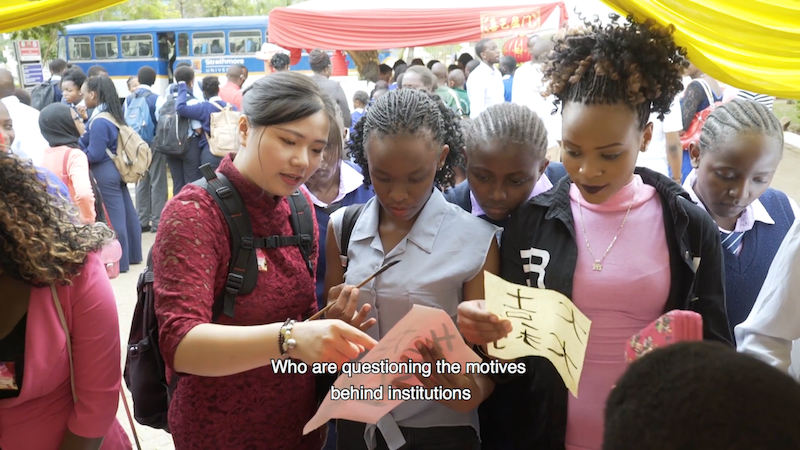 “Behind the Belt: A Look at China’s Cultural Influence in Kenya” features interviews with young Chinese and Kenyan professionals who are all trying to better understand the implications of China’s growing social, economic, and political presence in Africa. While younger people are often more optimistic about the inherent opportunities made possible by the China-Africa relationship, the film also reveals many of the tensions that bedevil the two sides as they become increasingly interdependent.